2003 – present, President and Founder, BioTrackers, Inc. There are currently two related research projects in the laboratory. Change in microbiota in CF patients in response to antibiotic treatment. In Cystic Fibrosis (CF), a mutation in the CFTR gene results in the production of thick, sticky mucus in the lungs that is difficult to remove. Bacteria that are normally not pathogenic in the lungs grow in this mucus and cause a chronic infection and inflammatory immune response. In CF patients, there are several bacteria that are resistant to most known antibiotics, making treatment difficult. Bacteria in CF patients are usually characterized in a clinic by cultivation techniques, but culturing only identifies a fraction of bacteria. New developments in sequencing technology are revolutionizing the study of complex microbial communities. 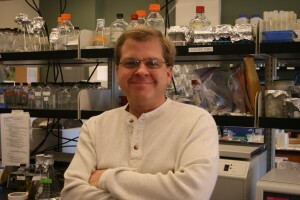 The goals of this project are to: 1) identify indicator bacteria and viruses whose change in abundance or diversity presage onset of a pulmonary exacerbation or other changes in patient health, 2) identify bacteria and viruses that are involved in disease progression, and 3) determine how antibiotics affect the microbial population in the lung. These goals serve as the foundation for development of personalized courses of treatment to manage infections. The two main techniques used to monitor the microbiota are Illumina sequencing and qPCR. In experiments analyzing sputum samples from a CF patient via Illumina sequencing and qPCR, the data indicate that 1) bacteria diversity can be high in CF patients not having an active infection, 2) while the presence of most taxa present in the lung change over time, a few specific pathogens are present in all samples, 3) bacterial diversity and abundance correlates with antibiotic treatment, and 4) standard antibiotic treatment does not remove all bacteria from the lung (Stokell et al. DOI: 10.1128/JCM.02555-14.). NIH funding has been obtained to expand this study to 15 adolescent CF patients. Antimicrobial resistance is a problem facing our medical system due, in part, to evolution of resistant bacteria. In CF antibiotic resistance is more common than in the general public due to the continual administration of antibiotics given prophylactically or in response to an exacerbation. It has long been recognized that bacteria can display cross-resistance (when a bacterial strain develops resistance to one antibiotic it simultaneously becomes collaterally resistant to another antibiotic even without exposure to that second antibiotic). Recent studies have demonstrated collateral sensitivity. In response to antibiotic treatment a bacterium becomes resistant, and then, in response to treatment with a different antibiotic, eventually develops resistance to that second antibiotic. Collateral sensitivity is when that bacterium developing resistance to the second antibiotic also becomes sensitive to the first antibiotic. In some drug combinations, when that bacterium is again given the first antibiotic and eventually becomes resistance to it, it simultaneously becomes sensitive to the second antibiotic. This little studied phenomenon suggests the possibility of addressing antibiotic resistance by cycling between those two antibiotics. The challenge is to identify the antibiotic combinations that lead to collateral sensitivity as well as the mechanism underlying the phenomenon. Burkholderia multivorans, a member of the Burkholderia cepacia complex (Bcc), is a Gram negative bacillus that is a pathogen often found in adults with cystic fibrosis (CF) . We are exploring collateral sensitivity and cross-resistance networks in B. multivorans. Our goals are to 1) develop a collection of strains evolved to be resistant by serially exposing B. multivorans clinical isolates to one of 6 clinically-relevant antibiotics, 2) testing resultant strains against the other 5 drugs to determine collateral resistance and susceptibility, 3) utilizing efflux pump inhibition methods to ascertain whether this resistance mechanism is responsible for cross-resistance, and 4) sequencing target genes to detect mutations responsible for cross-resistance and collateral sensitivity. To date, goals 1, 2 and 3 have been accomplished, and 83 isolates have been subjected to whole genome sequencing. That data is currently being analyzed. Flanagan, J.N., and Steck, T.R. 2017. The relationship between agar thickness and antimicrobial susceptibility testing. Indian Journal of Microbiology. 57(4): 503-506. DOI: 10.1007/s12088-017-0683-z. Stokell, J.R., Gharaibeh, R.Z., Hamp, T.J. Zapata, M.J., Fodor, A.A., and Steck, T.R. 2015. Analysis of Changes in Diversity and Abundance of the Microbial Community in a Cystic Fibrosis Patient over a Multiyear Period. J. Clin. Microbiol. 53(1): 237-247. DOI: 10.1128/JCM.02555-14. Stokell, J.R., Khan, A., and Steck, T.R. 2014. Mechanical Homogenization Increases Bacterial Homogeneity in Sputum. J. Clin. Microbiol. 52(7):2340-2345. Stokell, J.R., Gharaibeh, R.Z., and Steck, T.R. 2013. Rapid emergence of a ceftazidime-resistant Burkholderia multivorans strain in a Cystic Fibrosis patient. J. Cystic Fibrosis 12:812-816. Nicole Flanagan. Ph..D. student. Research project – identify and characterize collateral antibiotic susceptibility networks in Burkholderia multivorans. Uday Neelakantan. M.S. student. Research project – examine changes in microbial diversity in CF patients over time and during antibiotic therapy and pulmonary exacerbations. Logan Kavanaugh. M. S. student. Research project – identify mutations responsible for collateral antibiotic susceptibility in Burkholderia multivorans. Saravanan Neelakantan. Undergraduate Research student. Research project – collateral antibiotic susceptibility in Burkholderia multivorans. Sarah Harrison. Independent Investigations student. Project – elucidate mechanism of meropenem resistance in Burkholderia multivorans.